We saw the first signs of teething at around 3 months. T was dribbling a lot more and seemed grumpier in the evenings, but for no reason. He’d be moaning but not a typical cry. We didn’t see any rosy cheeks and his temperature didn’t change. It wasn’t until he chomped down on S’s finger one night that we realised his bottom two teeth had popped through. Thankfully, we had a few teething rings ready for when the moment came, but annoyingly T didn’t take to them. We also had a sofie giraffe which was better, but he couldn’t always get his mouth in the right position for comfort and would then get frustrated. 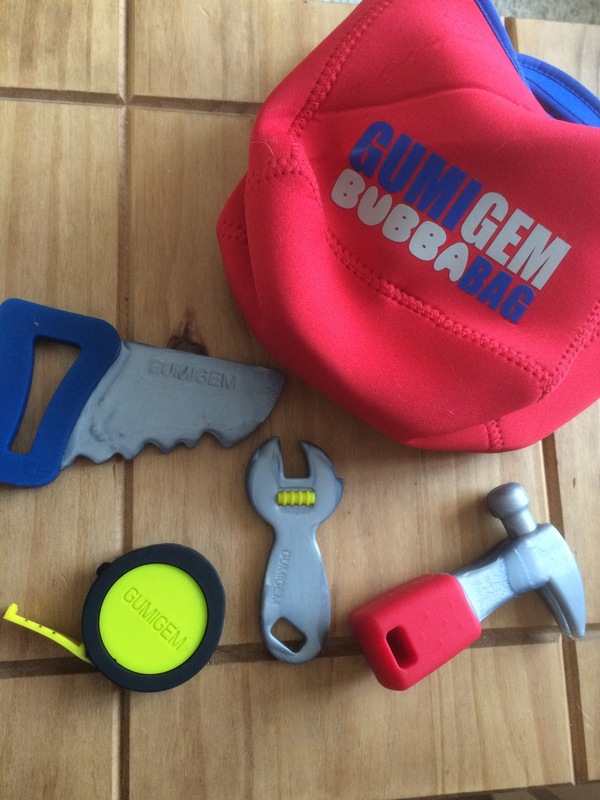 So when the lovely guys from GumiGem offered us their bubba bag, a collection of silicone teething toys in the shape of tools, we were over the moon. Although T’s coordination isn’t up to scratch yet, he’s constantly trying to put things in this mouth and is most happy when he’s succeeded. The good thing about these teething toys is that they’re small and the right size for little fingers and hands. I really like how the silicone is really soft but not too soft that teeth will go through it. I find a lot of teething toys are sometimes quite hard which isn’t always very comforting. The finishing touch is the cute little bag the tools come in. It’s made from a neoprene material so it’s waterproof – perfect for those dribble covered toys! As I write, T now has his top two teeth popping through so these toys have come at the perfect time. The hammer is his particular favourite. The bubba bag retails at under £20. You can find the teething toys and other teething items, including necklaces, at GumiGem’s website. 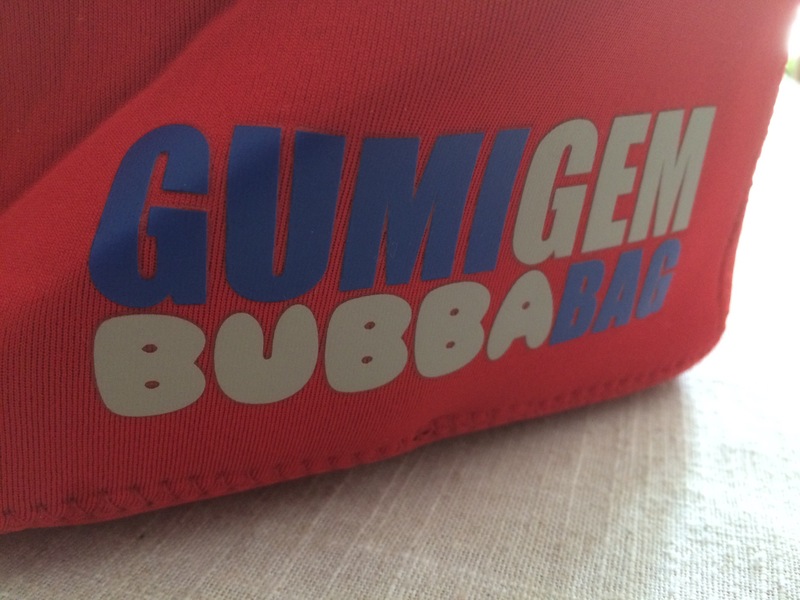 We were given the bubba bag for the purpose of this review. All opinions, however, are our own. Days Out – Our First Family Gay Pride. Those are so cute! A still doesn’t have any teeth coming in but he has gotten way more into teethers so I expect it’s around the corner! This is such a cute little set! We’re 99% positive Aria is teething, she has been displaying the signs for months but has recently been crying for no reason which isn’t like her, and chewing on mid air a lot! I’ve just given her some Ashton & Parsons at bedtime because she would not settle! I know, right. It’s lovely! That’s exactly what T was like. Lots of dribble and grizzly behaviour beforehand and bad moods afterwards. We’ve been using Nelson’s teething granuals and Dentinox teething gel. They’re both really good. Nelson’s use camomile so it’s calming as well. Good luck! Those are so awesome!!! I’m gonna have to look these up and see if they have them here in the US..our boys would love them, and as an ex union carpenter, this is right up Mamas alley! They’re really good – each toy served a different part of the mouth depending on how T used it. We were really impressed!